A six-year-old boy whose parents are fighting for permission to treat his epilepsy with cannabis is back in hospital. 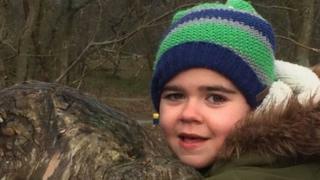 Alfie Dingley is being treated with intravenous steroids after experiencing a cluster of seizures. It is the second time he has been readmitted since returning from the Netherlands where he was given cannabis oil, which is illegal in the UK. His parents want the government to lift its ban on the medication. Alfie's mother Hannah Deacon has appealed to the Home Office and Prime Minister Theresa May to "act to help my beloved son survive and have the best life he can". She said: "We need your urgent compassion and action now. Please don't stand by and let my son suffer or die unnecessarily. "To see him in distress in hospital with his life in danger yet again is traumatic and heartbreaking. Cannabis oil is available for medical purposes throughout Europe, including in the Netherlands where Alfie and his family spent five months paying for treatment. Ms Deacon, from Kenilworth in Warwickshire, believes the medical cannabis products "are the only ones which have worked" to reduce her son's seizures - which occur between 20 and 30 times a day - in number, duration and severity. The Home Office has previously said it would consider a medical cannabis trial as an option for Alfie.